Ada Rehan was born in Ireland but came to the USA when she was six years old. She grew up in Brooklyn where her parents worked as actors. She had some minor acting parts herself as a child. Her acting became more serious between 1873 and 1875 in Philadelphia with Mrs. Drew's at the Arch Street Theatre. Subsequently she worked with John W. Albaugh's company at Baltimore and other places. She was of great physical beauty and in 1879 she joined Augustin Daly's newly opened theatre in New York and she stayed there until his death in 1899. She appeared in many cities in Europe and continued her acting career until 1906. Her best known part was Katherine in "The Taming of the Shrew". The last years of her live she lived in New York and there she died in 1916. 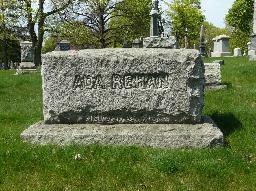 The grave of Ada Rehan at Greenwood Cemetery, New York City.